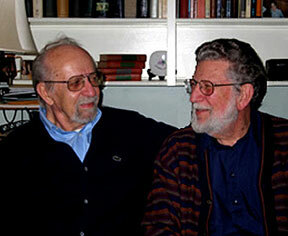 Robert Fossum with Sy Kahn, 2005. "We count the poetry subjects and themes as typical -- and perhaps prophetic for those younger than ourselves -- and probably familiar to our contemporaries. Poetry permits and encourages statements of individual perception and feeling which, we trust, will find resonance among all who read us." and Smyth sewn in wrappers. 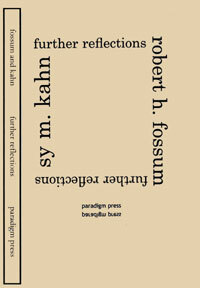 "Robert Fossum and Sy Kahn are both in their mid-fifties and have been friends for a quarter century. Colleagues in the English Department at Beloit College during the 1950's, they both currently teach in California, Fossum at Claremont Men's College and Kahn at University of the Pacific. They have both held Fulbright professorships in American literature at the University of Vienna. It seems fitting that they have now collaborated on a book of poems. Although not by calculated design, their parallel careers and experiences have inevitably led them to treat similar subjects in their poems. Yet each man brings his own voice, his own perspective and attitudes, his own mode of poetic expression to these subjects." I m in or out of reason. I have nightmares at high noon. Out of time and out of season. Rimed and reasoned with their time. I send them friendly greeting. And roar, on cue, in histrionic rages. When bears sleep fat within their lair. I may be shot quite out of season. I am not your ordinary bear. in Providence, R.I. in a run of 400 copies. 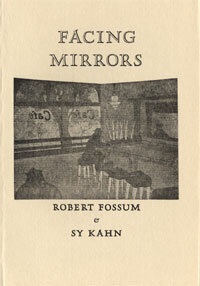 "Twenty-five years ago Robert Fossum and Sy Kahn published a book of their poems under the title Facing Mirrors. The book, in iteself, was a testimony to an abiding friendship that began in 1955, when they both taught at Beloit College, and prevails to this day, fifty years later. As did the earlier book, this collection suggest in its title that our lives have been lived in parallels, too often to be merely coincidental. Nevertheless, these latter poems report and speculate on individual and often parallel experiences which indeed bind our friendship. It seems natural to us to present our poems together -- quite likely for the final time, and that these poems would reveal the autumn colors of our lives and experiences." My grandpa and my grandma too. Gone underground or up the flue. I'm left with the big boo-hoo. To live, laugh and love, my dears. The tune of the big boo-hoo. And I stand here alone, boo-hoo. The circle of grand despair. 'Til they tripped and fell, boo-hoo. But I could not catch them! And grandma and grandpa too. They pass in a grand review. For better or worse, boo-hoo. Their roles play out, boo-hoo.